Tomorrow evening, I’m having dinner with a new friend which might not have come about had it not been for a little dog, Huan-huan. A few weeks ago, I was making my way up our river road on my search for an ice-cream bar. There are numerous small shops that line the road since we have 2 colleges on this route – ours and another very similar vocational school just a 5-minute walk further up. Students are always out to eat something so mom-and-pop restaurants, one-room repair shops, mobile phone businesses, snack shops, bakeries and necessity item stores can be found crammed together, one after another, in a long row. 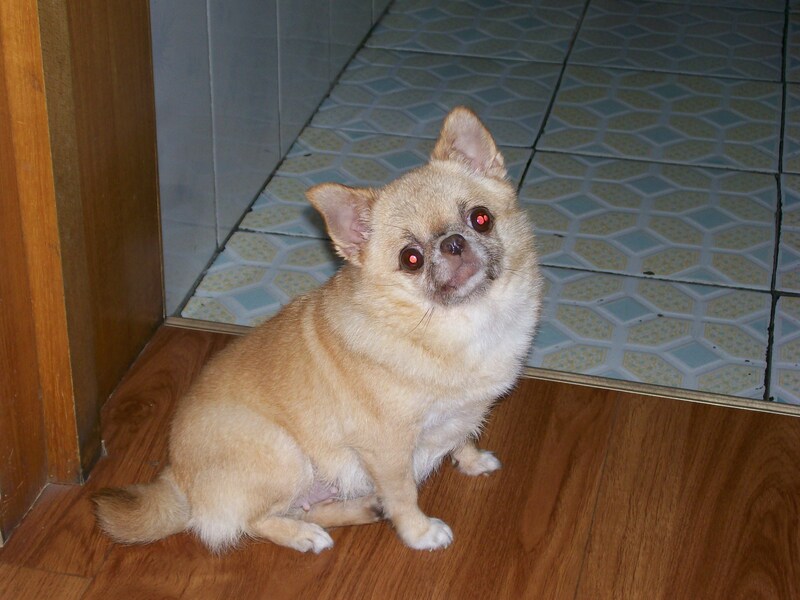 I was scouting out the ice cream freezer of a particular store when I spotted an itty-bitty, chunky Chihuahua prancing behind her elderly owner. Naturally, missing my Little Flower, I had to bend down to see if she was a friendly little thing. She certainly was! She plopped herself right down next to my feet and succumbed to numerous neck rubs with great enjoyment. “Is this your dog?” I asked in Chinese to the elderly woman smiling down at me. Yes, this woman remembered me from years ago when Little Flower and I would take walks along the river road, usually going to the local post office to pick up a parcel. Now, our school has a post office at the front gate but years ago, we had to trek 10 minutes along the walkway to the place where our mail was delivered. I explained that my little dog had died and how sad I was. As a single person, with no family here, I really missed my little dog. She said the same thing, telling me that she also was alone aside from her 2 daughters. They weren’t around, of course, as they were grown up and had moved to Shanghai for work and business. 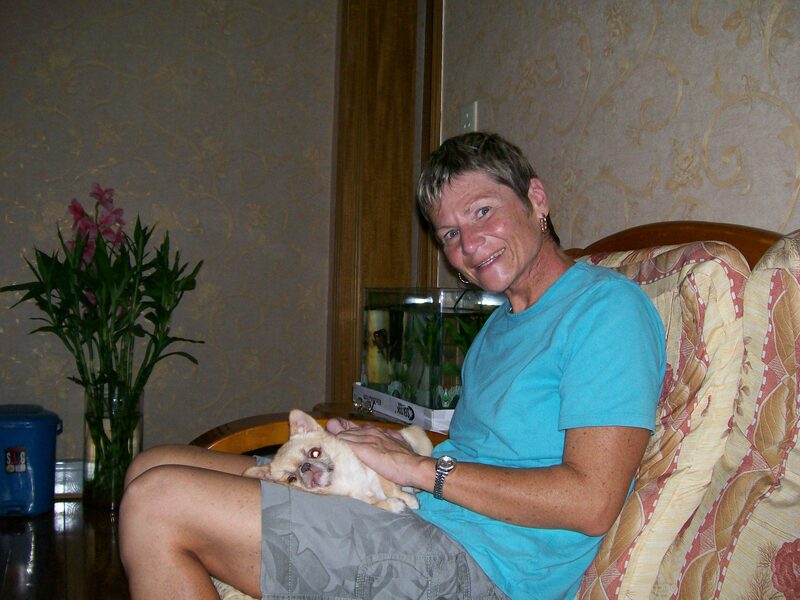 She just had her little Huan-huan (the dog) who was a wonderful companion. She next invited me to her home for a sit. She was a retiree from the college next to ours and was living in the dormitories for college staff and families. I don’t usually bother someone if they invite me to their homes at a moment’s notice but I was in no hurry. Plus I wanted to continue petting Huan-huan, who obviously enjoyed the attention. We walked through the gate of her apartment complex and she led me to the 3rd floor of her home. It was lovely little place, tidy, clean and well-appointed with pretty wooden floors. 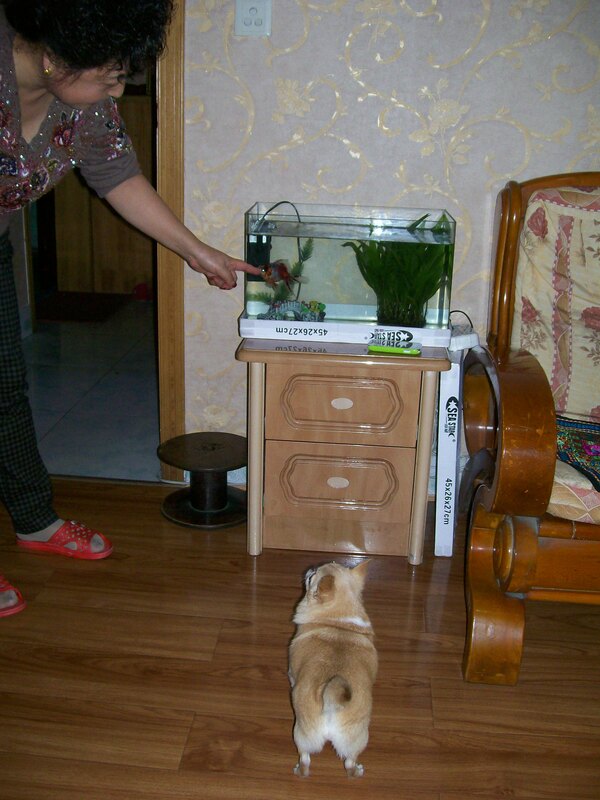 A fish tank held several fat goldfish which Huan-huan enjoyed standing on her hind legs and barking at. 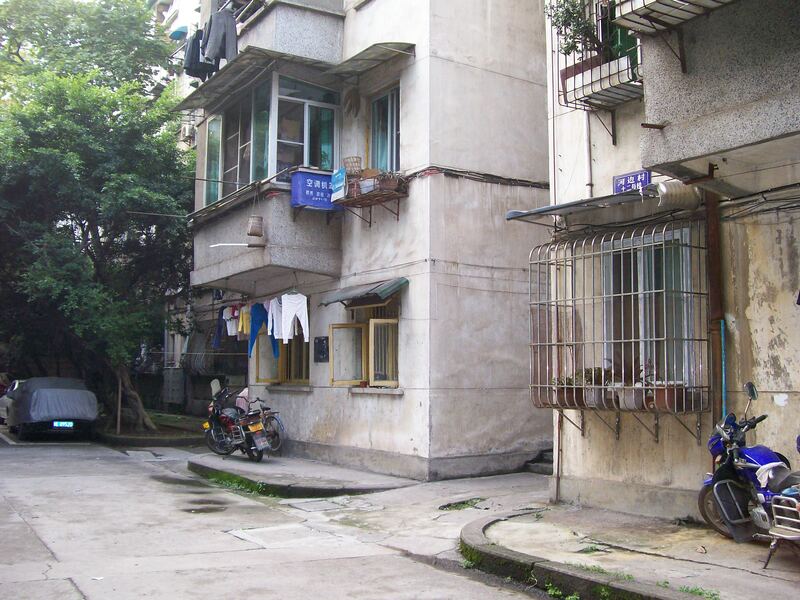 Mrs. Lu’s apartment building. She’s on the 3rd floor. I didn’t stay long but long enough for us to exchange names (her family name was Lu) and telephone numbers. I left and within 30 minutes, Mrs. Lu was calling me to invite me to dinner. We made an appointment for the next day and over I went. My Chinese is really awful so when it comes to speaking to someone for a long period of time, I get worried. 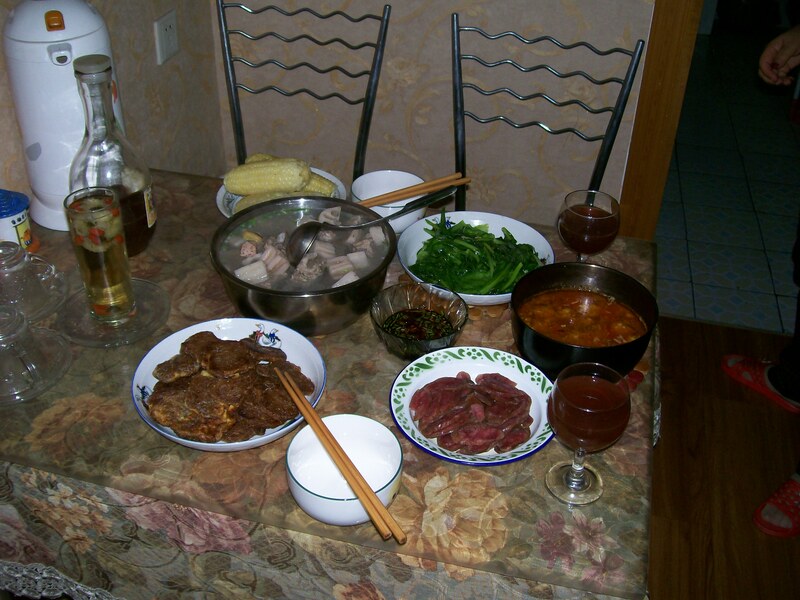 But Mrs. Lu’s Chinese was very standard and she made sure to slow it down for me enough that I was quite comfortable. For 2 hours, we enjoyed getting to know one another, eating her delicious home cooked meal and talking about all sorts of things. 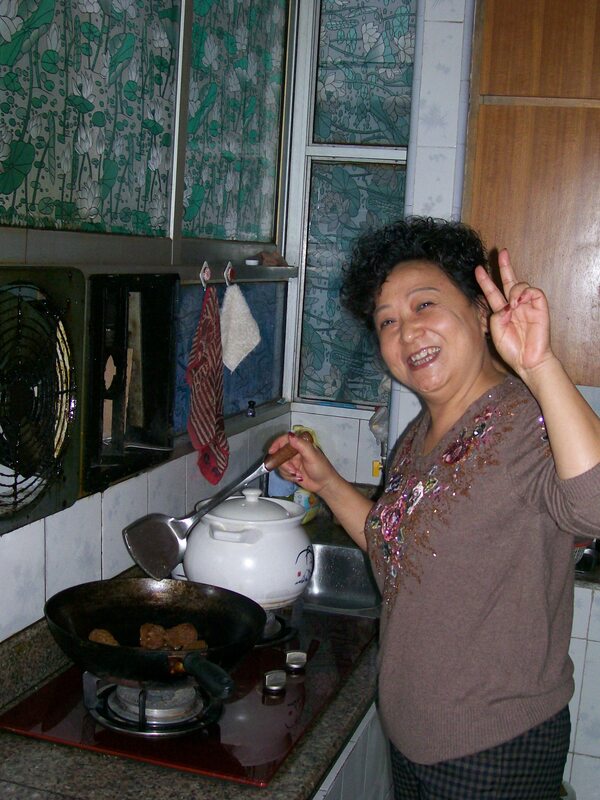 She explained to me that her daughters were in Shanghai. One was actually in Japan at the moment, working for a company that sent her there for 4 months. That daughter studied Japanese in college and also was a business major. The second daughter, the older one in her 30s, was married and had an 8-month-old child. Being so far away, she didn’t see them very often at all. 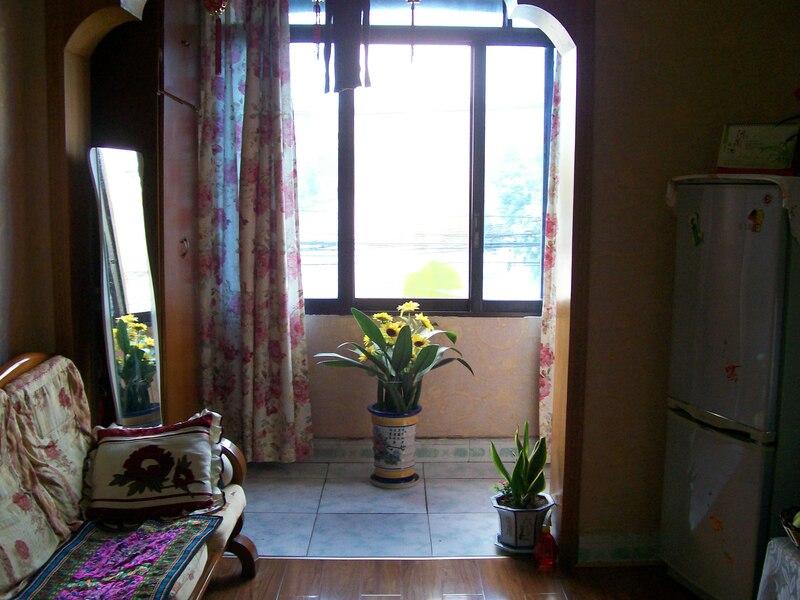 Little Luzhou is far, far away from Shanghai but our small airport has a direct flight there. She showed me pictures on her computer of a recent trip she took. In fact, Huan-huan had flown there with her. There was no mention of her husband and I didn’t ask. I’m used to these and usually I volunteer the information immediately so no one has to ask. But there are some questions that Chinese don’t touch on, such as “What happened to your spouse?” Divorce and death are things people don’t like to mention and the Chinese seem to know instinctively those are ones to steer clear of. So I didn’t bring them up, either. If she wanted, she’d tell me but she never did. After our lovely dinner, we sat on the couch for more conversation time. Mrs. Lu placed Huan-huan in my lap for more pets while she tidied up the table. We took several pictures together and then I called it quits for the evening. It’s been over 2 weeks since our first dinner together and I’ve been invited over again tomorrow evening. I’m looking forward to a home cooked meal but more than anything, I’m looking forward to more lap time with Huan-huan. My guess is that she’s looking forward to that, too. I’m so grateful to have not only a new friend to visit but a little dog to enjoy as well. It’s still hard for me without my Little Flower at home for company so having Huan-huan, even for one short evening, is a blessing. 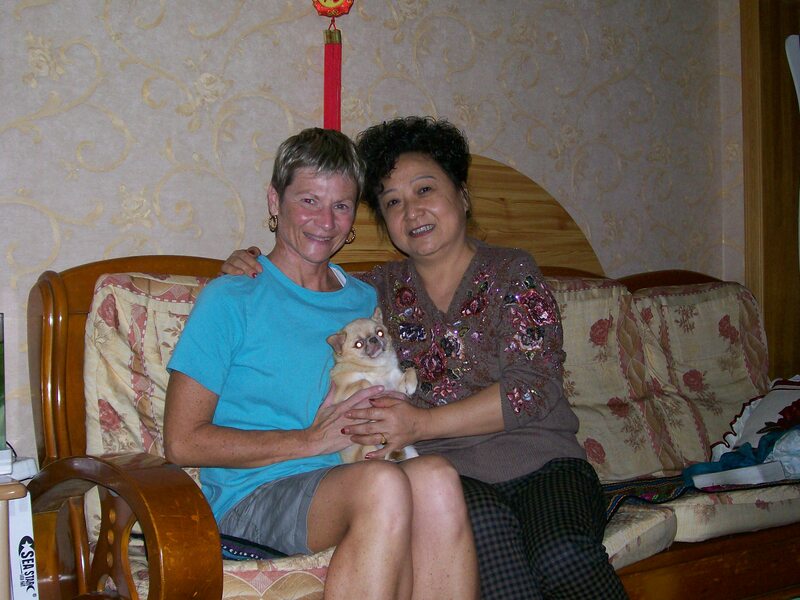 Huan-huan, get ready for plenty of lovin’ from your first foreign friend! From along Luhou’s Yangtze River, here’s wishing you Ping An (Peace) for your week.